Occasionally a part exchange offer to purchase your customer’s house, will not meet their expectations so that is where assisted move can help. Assisted move is an incentive used for potential purchasers of new build homes, who are dependent upon selling their existing home to fund, or part fund, their next purchase, but do not meet the criteria for part exchange. The assisted move proposition appeals to most customers because their home will be sold for them and they pay no estate agency fees. Fees are typically paid by the developer on completion. Assisted move provides the developer with the confidence of knowing that any potential buyer interested in purchasing one of their new homes will be able to sell their existing home so will have the funds to buy the new one. Through the assisted sale the developer also secures the buyer and retains commitment from them. 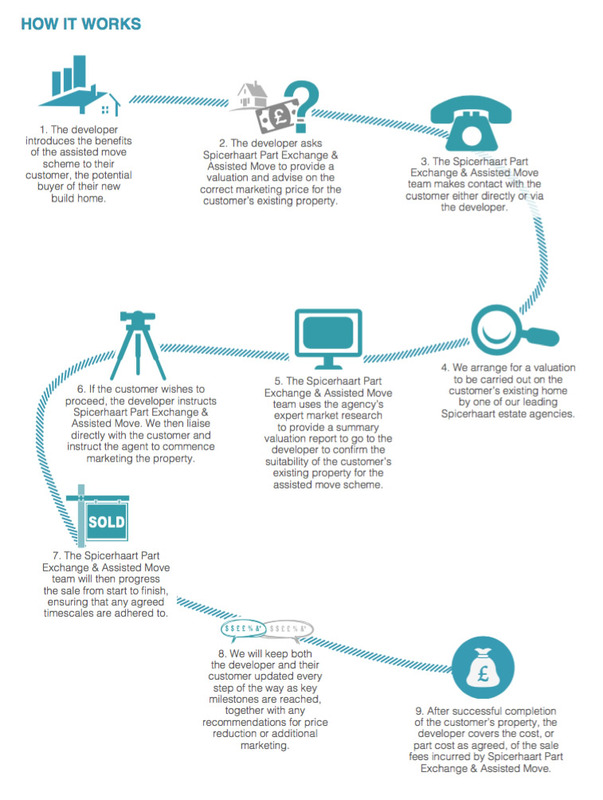 The Spicerhaart Part Exchange & Assisted Move team is highly trained so both you and your customer have the assurance that the sale will be in safe hands, valued thoroughly for a sale at the right price. You can be safe in the knowledge that your customer’s property will be marketed to its fullest extent and therefore has the best possible chance of selling. All sales are treated as a priority corporate instruction from start to finish, with reporting tailored to fit the needs of both you and your customer. We deal with the sale of the customer’s existing home as we would a corporate instruction. In short, the customer will benefit from an established, professional and specialised management service. We will instruct the best Spicerhaart estate agent in that region. We will instruct the estate agent to value the property, offer the property for sale and advise on realistic marketing prices in order to ensure full exposure across all leading property portals. We will report both to you and your customer on all viewings and viewer feedback, keeping you fully updated on progress at all times. Once an offer is received, we will keep you informed and discuss this with your customer. We qualify all offers to ensure they can proceed and, once accepted, we will progress the sale through to exchange and completion. 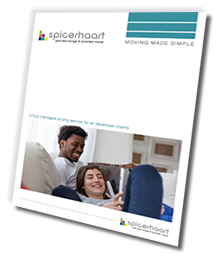 As an alternative to part exchange, Spicerhaart Part Exchange & Assisted Move has created a ground breaking assisted move service. Occasionally a part exchange offer to purchase your customer’s house, will not meet their expectations so that is where assisted move can help. Assisted move is an incentive used for potential purchasers of new build homes, who are dependent upon selling their existing home to fund, or part fund, their next purchase, but do not meet the criteria for part exchange. 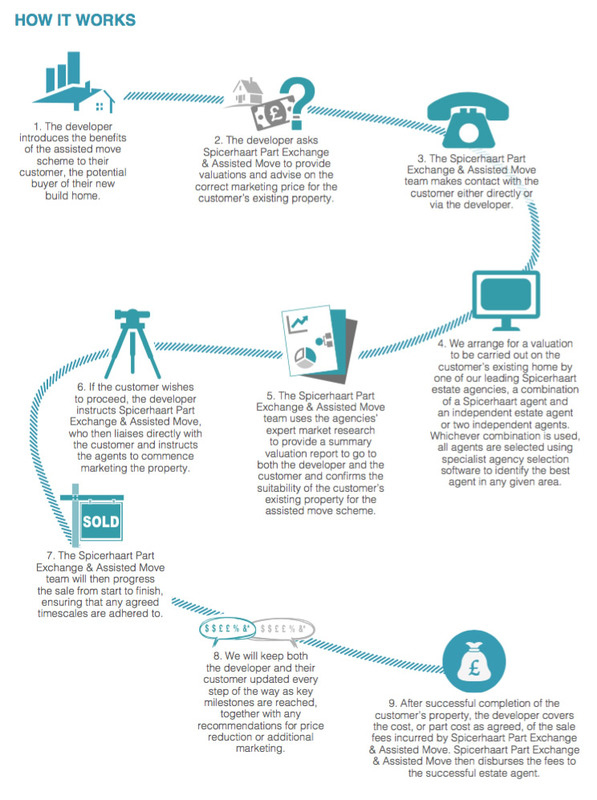 The Spicerhaart Part Exchange & Assisted Move team is highly trained so both you and your customer have the assurance that the sale will be in safe hands, valued by the right agents, for a quick sale at the right price. You can be safe in the knowledge that your customer’s property will be marketed to its fullest extent by the best agents and therefore has the best possible chance of selling. All sales are treated as a priority corporate instruction from start to finish, with reporting tailored to t the needs of both you and your customer. In short, the customer will bene t from an established and professional asset management service, something not generally available to individuals selling their home. We will instruct the best estate agents in that region whether this is a combination of two of our own group of ces, one group of ce and an independent agent or two independent agents. We will instruct the estate agents to value the property, offer the property for sale, advise on realistic marketing prices and ensure full exposure across all leading property portals. We will report both to you and your customer on all viewings and viewer feedback, keeping you fully updated on progress at all times. Once an offer is received, we will keep you informed and discuss this with your customer. We qualify all offers to ensure they can proceed and, once accepted, we will progress the sale through to exchange and completion.